I made this card using the CPS #74 Sketch. The image is from the Girlz & Boyz set by The Angel Company. I tried my hand at paper piecing, I think she came out pretty cute. I am just not sure about the shoes now that I am looking at it on here. The colors look much lighter on my screen than they do in real life. 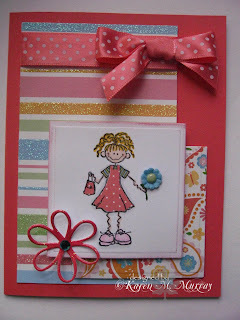 I colored the image with Copics and paper pieced her dress and purse with Papertrey Pink Patterns paper. I cut out the image with square nestibilities and rubbed metallic rub-ons cameo pink around the edge of the square. The flower is a cuttlebug die. I mounted my layers using mounting tape to give it more dimension. Here you can see the layers a little better. This is adorable. Good job. 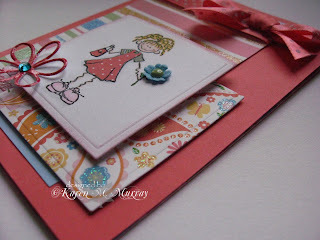 Very beautiful card...I love the paper piercing. And, I think her shoes are adorable. darling take on the cps sketch- she's adorable!